Allow this easy infinity necklace to help in your healing. 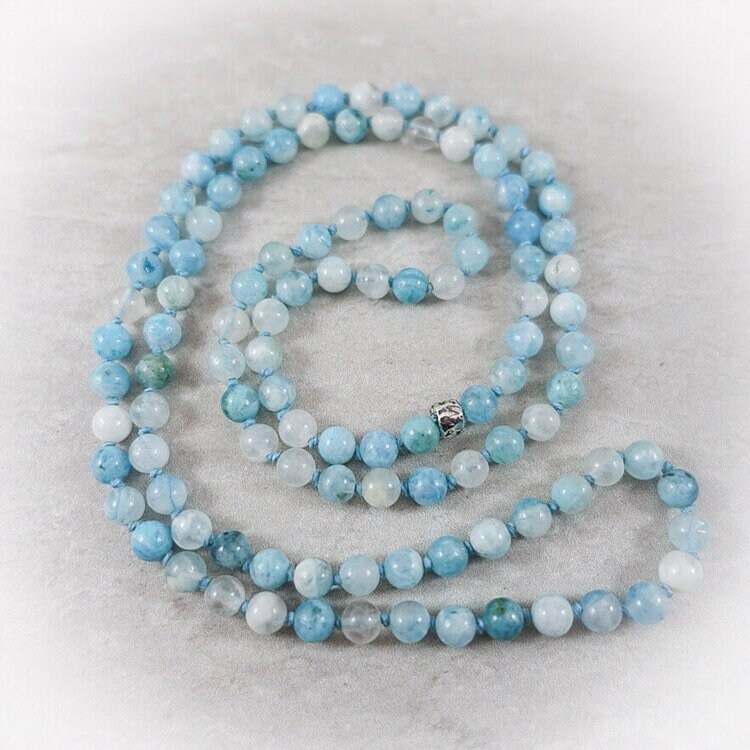 Hemimorphite is a stone of transformation that manifests the well-being on many levels, blending joy and sorrow into compassionate involvement and empathy for others. Grief transforms into joy with the support of this stone, as one stops resisting emotion and is able to let go. It allows one to be responsible for their own state of happiness or unhappiness. Blue Hemimorphite enhances the ability for one to communicate the truth of one’s feelings and is especially helpful for healing dysfunctional relationships. 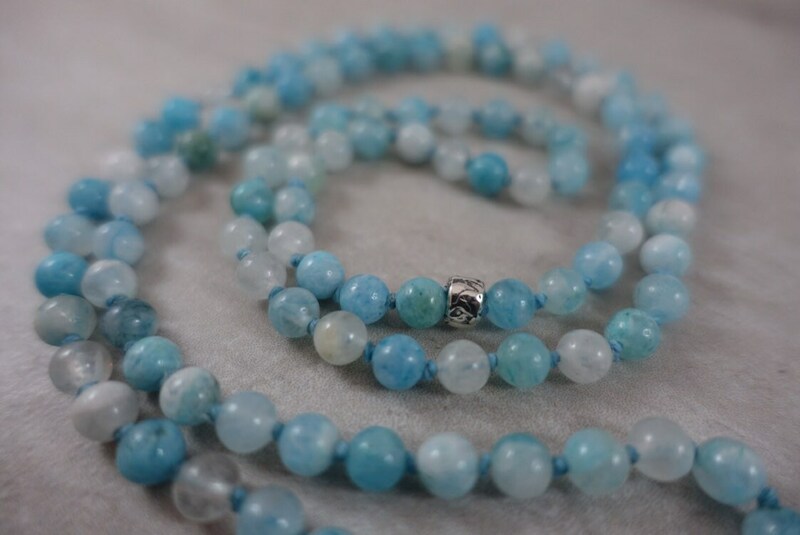 Hemimorphite may enable one to be open to communication, as a medium or a channel, with beings who have transitioned over to the spiritual realms. Hemimorphite is a stone of light activation, assisting one in integrating more light into the energetic, emotional, and physical bodies. 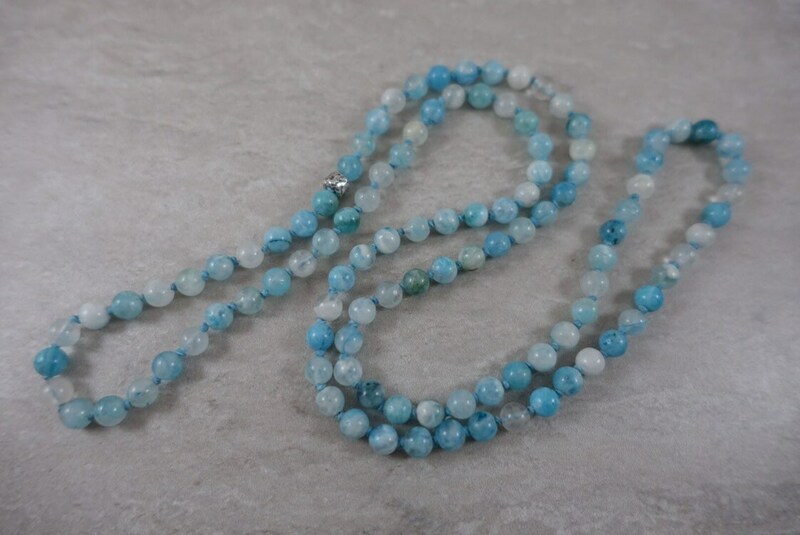 Blue Hemimorphite enhances the natural talents of healers and spiritual counselors and helps one to understand the powerful ancient techniques of healing. This piece measures to 28 inches, is hand knitted with turquoise Irish linen thread, and is finished with a rustic sterling silver bead. Wear alone or later with your favorite jewelry. “The Milestone Series.” The journey of life can feel taxing and overwhelming. There are ups and downs, bumps in the road, and deviations from our original plans. But life is full of momentous and exceptional moments that should bring us intense pride and gratitude for what we have done and are able to do. Each knot in the necklace symbolizes a milestone in a person’s life, a rite of passage to succeed and be fulfilled. While some milestones can feel negative and trying, in the end they craft and mold who you are as a person. Charish your achievements, let go of the anxieties you feel towards life’s negative moments, and embrace the balance of the good and the bad. As circular as the necklace, life’s cyclical journey is oriented by respecting the past, living in the present, and looking to the future.